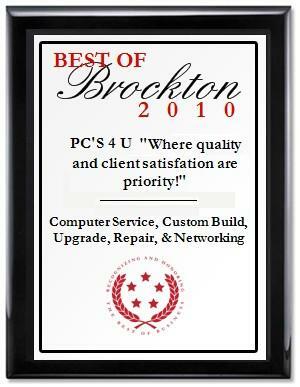 Welcome to PC'S 4 U where "Quality and Client Satisfaction are Priority!" At PC'S 4 U we repair, upgrade, build computers by request, and provide networking. Our main focus is on repairing and upgrading existing systems. We also specialize in building upgradeable systems. You tell us what you want the system to do, and we'll do the building from there. All estimates to build your system are free, there is no obligation. We do what it takes to insure customer satisfaction. WASHINGTON D.C., June 8, 2009 -- PC'S 4 U has been selected for the 2009 Best of Brockton Award in the Computer Service & Repair category by the U.S. Commerce Association (USCA). NEW YORK, NY, December 12, 2009 -- For the second consecutive year, PC'S 4 U "Where quality and client satisfaction are priority!" 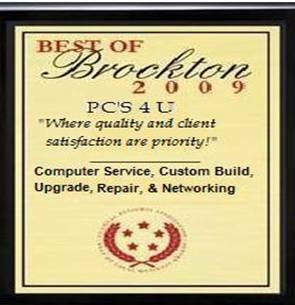 has been selected for the 2010 Best of Brockton Award in the Computer Service, Custom Build, Upgrade, Repair, & Networking category by the U.S. Commerce Association (USCA).